Google's popularity has transformed companies around the world to keep the rank highly in its SERPs to lure prospective customers to their sites. Google is software. Human being don't monitor or edit Google's results. Where your website ranks is a result of a computer algorithm. In the key to getting better ranking for your website lies in your ability to help this computer algorithm decide you're the most relevant result for a particular search. However, they often fail due to their inability to understand the Google Search Engine Algorithm. 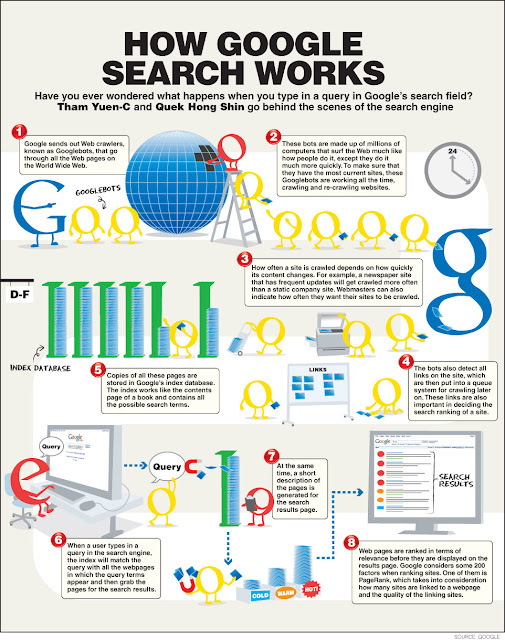 The infographic below highlights the basics of the Google Search Engine Algorithm. Google determines which search keywords are relevant to your website based on a number of factors. The most obvious factor is the content of your website. Within the content of your website Google gives a lot of weight to what you choose as your page title. Your page title is the information that appears in the browser tab when you visit a web page. If you want to get ranked for a specific keyword or phrase it's critical you include that keyword or phrase in your page. For example_ The title to this page is "How Google Works". Google is every trying to improve the quality of their search results. So they're constantly tweaking the formula they use to determine which sites are relevant and which are not. The import things to remember from this article are to create plenty of keyword rich text on your website, create a highly relevant page title that includes your targeted keywords, and most importantly work hard to get as many high quality links back to your website. Here is another pictorial presentation on how does Google work. Both Eric Schmidt and Jonathan Rosenberg came to Google as seasoned Silicon Valley business executives, but over the course of a decade they came to see the wisdom in Coach John Wooden's observation that 'it's what you learn after you know it all that counts'. Click here to read How Google Works.